Tack on two more wins for the South Winn boys’ basketball team (11-7, 11-4 UIC) after the squad downed Postville and Central earlier this week. Playing catch-up on postponed UIC contests, the Warriors hosted Postville (9-10, 7-8 UIC) Monday, winning 52-43. It was a slower than normal first quarter for South Winn, with the Pirates taking a 13-11 lead. Igniting the offense in the second period, the Warriors claimed a 29-24 halftime lead. Out front in the second half, the home squad kept the Pirates from attacking the basket for the win. It was a well-balanced scoring attack with Paul Hageman paving the way with 15 points and five rebounds. Jacob Herold chipped in 12 points, four assists and three steals. Also in double figures was Collin Wiltgen with 11 points and six rebounds. Adding eight points to the mix was Noah Tieskoetter. It was a senior celebration Tuesday night as South Winn hosted the “other” Warriors from Central (1-18, 1-12 UIC) for a punishing 79-42 victory. SW quickly put the game out of reach for the visitors, sprinting to a 24-6 lead after the first period. The advantage only grew in the second frame as the home team led 42-13 at the break. While Central tried to gather steam, there was no shutting off the SW offense in the second half as the home team poured in 37 points. Hageman had his best scoring night of his career with 19 points to go with a trio of rebounds. Contributing 12 points and three rebounds apiece were Wiltgen and Herold. Juniors Jaron Todd and Noah Tieskoetter added 10 points each. Pounding the boards to lead the team was Carter Wenthold with nine rebounds. 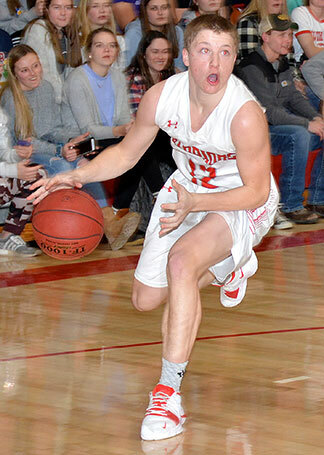 In the final week of the regular season, the Warriors host North Fayette Valley in a boys-only evening at 6 p.m. South Winn has a bye in the first round of the tournament and will take the court against MFL MarMac Thursday, Feb. 14, at 6:30 p.m. at Dunkerton.